Of all the many kinds of Chinese restaurant, the one that I'd like to see more of in London are Shanghai-style dumpling shops. Places like the renowned Din Tai Fung, where the signature dish is xiao long bao 小籠包, the famous soup-filled dumplings. Depending on their scale, these dumpling joints also serve dim sum and other dishes predominantly from the Shanghai/East China area. Despite my campaign, Din Tai Fung has yet to open in the capital, so in the meantime we have to make do with places like Dumplings' Legend. A lot has already been written about this restaurant, and the reaction has been varied, much like its dinner menu. Some might think that it's a good thing that the menu offers selections from all across the Chinese-speaking world but I beg to differ. Whilst we're used to Chinese restaurants offering a varied mix of dishes, most places anchor themselves in one cuisine. At Dumplings' Legend, the offerings include Cantonese, Shanghainese, Sichuan, Taiwanese, and Straits Chinese dishes with no single cuisine dominating. So it was with some difficulty that I managed to order a mix of dishes that I thought might work as a cohesive dinner. These were the highlight of the evening, in particular the spiky Sichuan starters of the cucumber and wontons. I also liked the more-ish quality of the sweet potato fried with salted egg yolk. However, despite being described as starters, these dishes came out with the rest of the order in a haphazard fashion. This disrupted the flow of the dinner and detracted from the enjoyment of the meal overall. You could argue that this is the Chinese way, but at the very least, it would've been nice to be given the choice. The siu loung bao (this is the Cantonese transliteration of the Mandarin name, xiao long bao) held their soup but I could barely pick out any crab. They're probably on a par with Leong's Legends, which means they're pretty good by London standards. However, they remain pretty average compared to XLB found in China. That's more than can be said for the steamed prawn dumplings. I was expecting har gau 蝦餃 with their translucent tapioca wrapper and juicy prawn filling. Instead these were ugly doughy affairs with a dry filling – pretty abysmal. Avoid. I was looking forward to the three-cup chicken, so called because it's made with a cup each of soy sauce, sesame oil & rice wine. Sadly a dish that should've been called 'one-cup chicken and red pepper' came out instead. Two of the cups had gone AWOL leaving the dish tasting mainly of soy sauce. Leong's Legends does this dish so much better. The pick of the mains was the perfectly steamed sea bass fillet. Having said that, I would've preferred to be able to order a whole sea bass rather than just a fillet. The choi sum with garlic was decent enough but the fried beef ho-fun rice noodles were mediocre and pretty forgettable. Service was OK in a perfunctory Chinatown way, but I didn't care for the lighting, which was interrogation strength and a bit of a mood-killer. And in a recurring theme of this review, the ambience compares poorly to Leong's Legends. Together with steamed rice, tea, and a bottle of Riesling (chosen by my old mate, Mr Wine), the damage came to around £112 including 12.5% service, which is fair enough for a party of four. This restaurant also serves a full dim sum menu before 5pm, which may be a better proposition than dinner. Dumplings' Legend is a bit of a missed opportunity let down by an over-ambitious menu that fails to consistently deliver. In my opinion, they would be much better off emulating the Din Tai Fung formula by majoring in the cuisine of Shanghai/East China. Mind you, there are worse places to eat in Chinatown and if you don't mind eating in Europe's most brightly lit dining room then this is a decent stand-by option. ...the Sichuan starters then you'll probably like the Empress of Sichuan, which is easily my favourite Chinatown restaurant. But if the xiao long bao and three-cup chicken is more your thing then I recommend Leong's Legends (you might have already worked this out by now!). Incidentally, it is my understanding that the same company that operates these two restaurants also manage Dumplings' Legend. Joining me for dinner was fellow blogger, Ute of Hungry In London, her friend, and Mr Wine. For Ute's review of this restaurant, please click here. Amongst the most popular Chinese dishes in Britain is crispy aromatic duck but like General Tso's chicken in the USA and dim sims in Australia, it isn't a dish that would be easily recognisable in China. So how did the crispy aromatic duck that the British know and love come into being? The crispy aromatic duck served in Britain has its roots in a dish from Sichuan that shares the same Chinese name, xiang su ya 香酥鴨. Both dishes are prepared in the same way with the duck marinated with herbs and spices, before being steamed until tender, cooled, and finally deep-fried until crispy. Mind you, many Chinese restaurants in Britain take the shortcut of using pre-prepared ducks that merely need to be defrosted and deep-fried before serving. Whilst the preparation is similar, the presentation of these two types of crispy aromatic duck is very different. The original version isn't served with pancakes, cucumber, spring onion and hoisin sauce, and nor is it shredded at the table by a waiter or a waitress. Instead the duck is chopped into pieces and is served on its own or sometimes with steamed buns. I did some more research but I didn't get very far in that I couldn't find a restaurant or a chef who claims to have 'invented' this dish. The only information that I could find is that crispy aromatic duck was first served in London's Chinatown sometime in the last century, which isn't really that much of a revelation. My own theory is that some canny restaurateur wanted to serve a Peking duck style dish served with pancakes et al, that didn't need as much preparation as Peking duck itself. My feelings about crispy aromatic duck are quite ambivalent. It isn't as bad as some of the dishes that pander to western tastes, but at the same time, I think it can tend to be a bit dry. I prefer Cantonese-style roast duck (燒鴨) and Peking duck (北京烤鴨) as they're both juicier, although it's hard to track down decent renditions of the latter in London. But for all that, I sometimes eat crispy aromatic duck, usually in the company of friends who adore it. The most recent occasion was at the award-winning Empress of Sichuan, where it worked surprisingly well as a gentle starter before a typically spicy onslaught. And it was during this meal that I began to consider how in many ways, crispy aromatic duck symbolises British Born Chinese such as myself. I mean it's undoubtedly Chinese, but it's undergone a few changes, some good, some bad, to get along in the place it calls home. Business dinners can sometimes be awkward stilted affairs but there was no danger of that with my new tomodachi, N and S. After a long day at the office, we went to one of their favourites, Charari Charari for dinner. We were still in Kudankita but unlike some of the places we went to for lunch, this was a proper restaurant. I left the ordering to my hosts, and the food soon started coming. 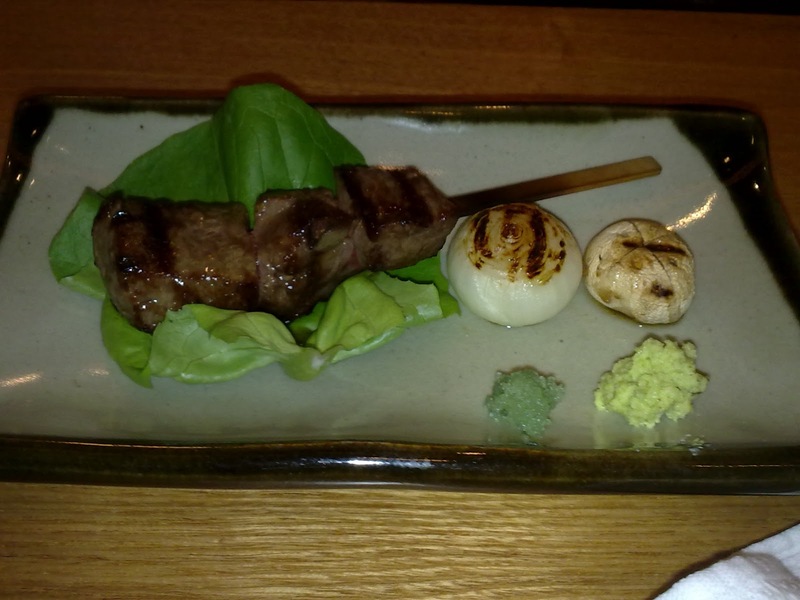 To kick off with, there was some salad followed by loads of yakitori skewers. My favourite was the chicken 'meatball' or tsukune. As well as orthodox chicken bits like wing and thigh, we also sampled chicken liver, skin, and heart. I must admit I wasn't a fan of the latter. After the skewers, came a rather excellent sashimi platter. And yes I know I used flash photography, which is a bit naughty, but no one seemed to mind. Honest. As good as the skewers and sashimi were, the star of the evening was the kara-age or Japanese fried chicken. Marinated in a very Asian mix of soy, ginger and garlic, then coated in flour and fried to perfection, Colonel Sanders ain't got nothing on this. With a squeeze of lime and a dip in the accompanying mayo, this was one of the highlights of the trip. And if that wasn't enough, we finished off with yaki onigiri (crispy rice balls) and the ubiquitous miso soup. I think it's the law to have miso soup with every meal! A great end to a great meal, with my only regret being not having enough space for dessert. On another night, we went out in Ginza and ended up in a restaurant specialising in the cuisine of the Akita prefecture in the north of Japan. I would like to claim that we went there especially to sample some regional Japanese cuisine, but the more prosaic truth was that it was close to where we were drinking. The menu had pictures and whilst I offered a few suggestions, I left the ordering to N and S. The food again was excellent, my favourite being the beef fillet that was seared on the outside then sliced and served at room temperature. 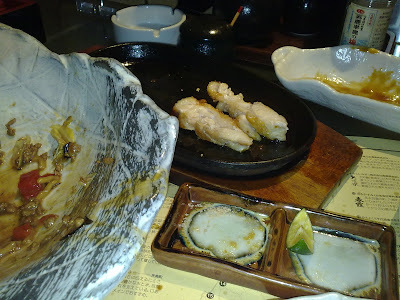 Other highlights included the two types of grilled chicken, Japanese omelette, chicken meatball, and an Akita speciality of fried noodles in plum sauce topped with a fried egg. The company I work for has two offices in Tokyo, and whilst I was in Kudankita with N and S, my colleague was based in the other office. The guys from this other office were also a convivial bunch, and we joined them on a couple of nights out. Not wishing to be outdone by N and S, they took us out to the wilds of Roppongi to a shabu-shabu restaurant. 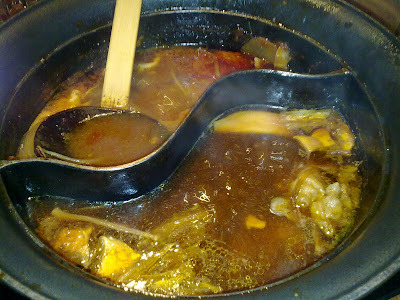 I love hot-pot in all its guises, and whilst I prefer the Chinese version, this was pretty damn good. I was particularly impressed by the quality of the meat as exemplified by the marbled beef slices. Less enjoyable was the soy milk that was one of the four 'soups' bubbling away; I much preferred the traditional konbu based broth. To round off the week, we continued the DIY vibe with a visit to a Korean BBQ joint. We were seated at a table with a proper open grill rather than one of those wussy hotplates that they use in places like Koba. Yet again I was impressed by the high quality of the produce and my final meal in Tokyo was another winner. This is the last of my series on Tokyo, and whilst I had a great introduction to Japanese food during my visit, that's all it was. I would love to return to Japan and properly immerse myself in the food culture. For starters, there are so many more noodle dishes to try, then there's the fine dining extravaganza that is kaiseki, as well as simpler grub like okonomiyaki. Being a bit of a food geek, I also want to try the Japanese take on western food, as well as their version of Chinese food. But just because I'm back home doesn't mean I can't tuck into more Japanese food. I'm a fan of Roka, like the noodles at Koya and Ramen Seto, have tried Sushi of Shiori, and Yashin Sushi is on my 'list'. Are there any other places that I should be aware of? I'd love to hear your top tips for Japanese food in London. "Can we go for ramen tomorrow?" I asked on the walk back from the tempura shop. "Tonkotsu," I interjected. "I like pork bones." "We can do better than that," N said. "We'll go to the best ramen shop in Kudankita – they serve a very special ramen." Ramen Day or 27th January 2011, as it's known in the Gregorian calendar, will stay long in the memory as the day on which I sampled some of the best noodles of my life. The morning of Ramen Day went really slowly, and it felt much later than 11.30 when N and S came to fetch me. This may seem early for lunch but by the time we arrived at 九段 斑鳩 (its Romanised name is Kudan Ikaruga but you won't see this on any signage), there was already a lengthy queue. Whilst N kept our place in the queue, S and I went to the machine to order. By the side of the machine was a certificate that proclaimed that we were indeed going to sample the 'Best Ramen 2010' in not just Kudankita, but in all of Tokyo. Now anyone can put up a random certificate but this one was awarded by the tabelog website, where punters rate their favourite restaurants. After we got our tickets for 特製らー麺, which translates as 'No.1 Special Noodles', we rejoined N in the queue. The wait was beginning to get to me, especially as I could smell the soup wafting through the cold January air. Eventually a waiter came out, took our tickets and told us that there'd be a table ready shortly. It was about 11.50 by the time we eventually entered the ramen shop. As the waiter had already taken our order, our noodles arrived shortly after we were seated. And it was well worth the wait. This was noodle heaven. The ramen were springy and bouncy. Proper QQ. The toppings were a revelation, especially the tender chāshū pork (the Japanese take on cha siu). I also loved the perfectly boiled egg, and let's not forget the menma (fermented bamboo shoots) and dried nori (seaweed), which added a contrast in flavour and texture to the dish. But as good as the ramen and the toppings were, it was the soup that had me in raptures. Traditionalists may want to look away now, as the soup in the 'No.1 Special Noodles' consists of a blend of tonkotsu (pork bone soup) and gyokai (fish soup) with a shot of shoyu (soy sauce). The resultant milky broth was amongst the best that I've ever tasted. Tonkotsu can sometimes be too overwhelmingly porky and a little fatty, which is why the gyokai was such a welcome addition, as the smooth fish flavour took the edge off it. It was so damn tasty that I wanted to lick the pattern off the bowl! To order 特製らー麺 No.1 Special Noodles, press the No.1 button on the machine. It's a bargain at Yen 880 (apx £7). ﻿Local knowledge. You can't beat it, especially in a country like Japan, where the language is pretty alien. So as much as I enjoyed exploring the culinary delights of Tokyo off my own bat, I was more than happy to be guided by locals like my colleagues, N and S. These guys took great pleasure in introducing me to some of their favourite lunch haunts. On Monday, N hedged his bets and took me to a bit of an all-rounder that served both donburi rice bowls and udon noodles. I went for a set lunch of ten-don (rice topped with mixed tempura) that came with a mini-bowl of udon noodles in shoyu broth. The tempura was good but not great, and I cast more than a few envious glances at the sashimi-don that the others were eating. With hindsight, I should've just ordered a large bowl of udon noodle soup rather than try to have it all. A valuable lesson learnt. Tuesday was teriyaki day and we all went for the spicy chicken teriyaki set lunch, which included a bowl of salad and some miso soup. By the time I was finishing off my salad, a box of rice topped with spicy chicken teriyaki, egg, some pickles and dried seaweed flakes arrived. I marvelled at how well the different ingredients complemented one another, especially the dried seaweed-runny egg yolk-rice combo. On Wednesday, we went to Fujigonomi (天ぷら革命 ふじ好) to try the mixed tempura set lunch. Almost as soon as we sat down, some miso soup and a bowl of rice appeared, and then the first of the tempura arrived. Rather bizarrely there was a piece of sesame prawn toast alongside the two prawns and the shrimp cake. Being impatient, I ate one of the prawns in the 30-second gap between taking a photo and the arrival of the rest of the order, which included more prawns, aubergine and sweet potato. Fresh, crispy and not over oily, this is how tempura is meant to be. It was much better than the stuff I had eaten on Monday. I had a very special lunch on Thursday, and it was that good, it gets its own dedicated post. Can you guess what I had? On Friday, we popped down to the local sushi joint for some top class nigiri and maki. I'm no expert when it comes to sushi and my naiveté was exposed when I was mocked for using chopsticks and not my hands. This was really good sushi, and I particularly liked that the wasabi had already been added, as it ought to be, to the nigiri. I'm not the biggest fan of miso soup, but the version served here had prawn heads in it, which made it more interesting. All of the above places are in the Kudankita district, but sadly I couldn't find any websites to link to, other than for the tempura joint, Fujigonomi. That said, these are all casual joints and I'm pretty sure most if not all Tokyo districts have eateries of a similar standard. Now I'm back home, I'm more envious than ever of how the Japanese do lunch. In the time it takes to get a sandwich and eat it, you could have a proper meal in Tokyo. And it's pretty good value too, a chicken teriyaki set cost Yen 790, which at the time of writing, is around £6.50. Lastly, I'd like to thank N and S for being such top blokes in and out of the office. Not only did they love their food but in S's case, he also loves my kind of music. I wasn't too surprised that he liked early Oasis, but who would have guessed that S would be such a big Stone Roses fan? Discombobulated. I thought I would be on my first visit to Tokyo, and indeed Japan, but I wasn't. I think that had a lot to do with staying in Ginza, an upmarket shopping district dominated by luxury brands like Chanel and Prada. But I wasn't in Tokyo for shopping; I was there for the food, well technically speaking I was there on a business trip. Ginza is full of places to eat, and in addition to all kinds of Japanese food, I was surprised to see so many Chinese, Korean, and European/Western restaurants. Some of the western food made me laugh, especially the 'pan-Mediterranean' joints that sold both paella and pasta. I guess this is the mirror image of the pan-Asian joints that are so common in the west. But for my first meal in Tokyo, there was only one thing I was looking for. So whilst my colleague had a Sunday afternoon nap, I went in search of noodles. I wasn't getting much joy on Ginza's main drag – too posh for its own good – so I dived down the side streets. It wasn't too long before I found a tiny noodle joint with about eight seats. Just the job! As I can't read Japanese, I chose by picture, and ordered using the machine in the corner. This system gives a whole new kind of meaning to the term, hole-in-the-wall! I went for what turned out to be soba noodles in a soy-based broth topped with shrimp tempura cake and spring onion. It wasn't anything special but it really hit the spot after the long flight from London, and it only cost around the equivalent of £3. When my colleague awoke, he was hungry and he suggested we go for dinner at a robatayaki. So off we went to hit the streets of Ginza, and after a bit of wandering around, we found somewhere that fitted the bill. We were seated at the counter where beef, chicken, seafood and assorted vegetables all jostled for attention. It was a real education watching the chefs cook on an open charcoal grill, and of all the dishes, the beef skewers were our favourite. As much as I enjoyed the robatayaki, you have to be in the mood for it. Other times, you just want something quick and easy, something like a curry. In common with many cultures, the Japanese have their take on curry. So after a long day at work, I was more than happy to find a little tonkatsu joint near the hotel. Everything on the menu was a variation of tonkatsu (deep-fried breaded pork), and I went straight for the tonkatsu karē, breaded pork loin with curry, rice and salad. The best part of this dish was the excellent curry sauce that had been pimped up with bits of pork belly. I thought I'd done well left to my own devices but really it was nothing compared to the treats that my Japanese colleagues had in store for me. In the next post, I'm going to focus on where they took me out for lunch. PS: I'm sorry I can't tell you more about the places where I ate, but none of them had any signage in English or for that matter, Romanised Japanese. Nor according to their business cards did they have a website that I can refer you to. In subsequent posts on Tokyo, I will, wherever possible, link to websites although you may need to use Google-translate for those that don't have an English page. Kung Hei Fat Choi! Gong Xi Fa Cai! 恭喜發財! I'd like to wish my readers all the very best for the Year of the Rabbit! I feel bad that I haven't prepared a special themed post to celebrate the Lunar New Year but I've been really busy lately. Anyway, I hope to make up for this oversight with a series of posts on what many consider to be the best foodie city in the world. Watch this space!